Hi Bulk - Soft Touch - made with cotton blended paper! 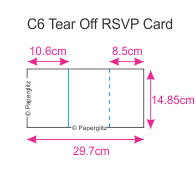 The C6 Tear Off RSVP Invitation Card is a unique card that is popular for brides wanting to save on the expense of a return RSVP envelope - the integrated tear off (perforated) RSVP is usually printed in a postcard format and guests can just complete, tear off and return. This C6 Tear Off RSVP Invitation Card is made from our gorgeous double sided bright white coloured ultra thick 360gsm card that contains 15% pure cotton & 20% recycled content! This DIY Invitation Card arrives flat packed & unfolded making them easier to print. When folded they measure 14.85cm x 10.5cm and are commonly used in both portrait and landscaped formats. Strictly speaking they are in fact A6 Scored (1/2 an A4, folded in half) but as they fit in the C6 Envelope we think it is easier to call them C6 to avoid any confusion. This C6 Tear Off RSVP Invitation Card is made from paper that is manufactured in Italy and is converted and packaged by Paperglitz in Sydney, Australia. Made from a premium range of soft to touch cotton blended papers that is popular for both letterpress printers and wedding stationers. Buy with confidence and specify only "Genuine Paperglitz C6 Tear Off RSVP Invitation Cards" for your next project. ™ Cottonesse is a trademark of B M G Marketing Pty Ltd, trading as Paperglitz and may not be used without prior written consent. Unauthorised use is a breach of Australian and International Law. Paperglitz are always super quick in processing and delivering my orders. I wish all my suppliers were so good. You are a champion! Thanks so much for getting this order in yesterdays mail, it arrived 9.30 this morning. Also thankful for your help with colour choices, and now with future orders there will be no uncertainty on colours. Thanks again!